Yeeeauupphhh- yawn, stretch, scratch, sniff- what is wrong with me? Resolve to wash hands thoroughly, then bleach rest of self. But hygienic issues aside, it is Monday morning, so let's have some coffee. We can skip over the rest of last week because this weekend was pretty darn good. It started with Pleasant Friday, then Bright Saturday, followed by Sublime Sunday. Sunday was by far the nicest day of the year to date. It was, was, was- warm. It was pleasant. There was no wind. The sun beat down and left its mark on my face. So I did what anyone would do and beat my streamer curse. If you haven't heard this before, it is true that until now I have been unable to catch fish on a streamer. Oh, I've caught a couple, but mostly by accident and bad luck (for someone), and never any of the largish fish you see on a regular basis bandied around like so many pin-up girls. 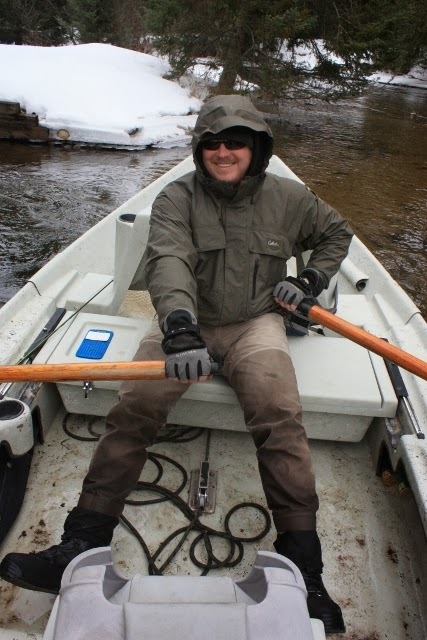 Alex Cerveniak of Northern Michigan Fly Fishing Guide Service called me on Wednesday via Bat Signal. I have no choice but to respond. We roped in our friend John Schmidt, but of course he came willingly. We met at Gate's Lodge then hit the river under bright sunny skies and warming air. It is difficult to explain to you, the rest of the country, the exhilaration and joy of being out on a pleasant day after a hard winter like the one we've had, to catch not just any fish, but some really good ones. It was like that moment in Shawshank Redemption but with sun and beer instead of rain and sewage. Okay, so on my first good fish of the day Alex dropped anchor as soon as I made noise and we soon got it into his meager net. My next fish was different. We dropped into a great spot where fast riffly water spilled over a deep flat. Sensing opportunity I wound up and made a reverse cast. On about the fourth strip my fly stopped. I didn't react instantly, but when my rod bucked and a great golden slab rolled in the current I shouted enthusiastically to my friends- "Big fish, big fish, BIG fish!!" They did nothing. As a matter of fact they laughed at me and kept yakking, while my fish started to run downstream. When my line nearly wrapped around John in the front of the boat they turned and looked. Alex looked into the water, saw a dull yellow flash the size of an oar and started shouting expletives. He dropped the oars and the anchor and we managed to net it. It was 23" long and heavy, with thick shoulders and a mercenary look. John Schmidt caught a really nice fish on an old glass rod that had belonged to his father, which had him totally thrilled. John works a night shift. He basically got home, slept one hour and then met us at the fly shop, yet he was energetic and upbeat the entire day, the kind of thing that can make you hate young people. Alex, he worked the oars and kept us in position. He fished a little but not long enough to score. It's early yet, the streamer bite is just getting going. We're at that point when mid-afternoon when the day is warmest and the water has had some time to warm a little is the best fishing time. The slight stain to the water added by the daily run-off doesn't hurt at all. It was a fantastic day all in all, with warm sun, a few good fish, and good times with friends. If I had to make a fishing forecast I'd say this coming week is going to be stellar- the forecast is for mid-thirties to mid-forties for the next ten days with no blow out rains. The steelhead should be pushing into all the rivers in earnest and the streamer bite will continue to improve, though at this stage sunny afternoons that warm into the forties will be best. I'm out of time and out of coffee so I'll leave you with a few more shots of the day. Errrrgggghhhh! Yawn, stretch, scratch, sniff. Is it Monday already? Let's have some coffee. Yes, posting here has been a touch sparse, but with the bitterness of the winter I haven't had much fly related stuff to drone on about. 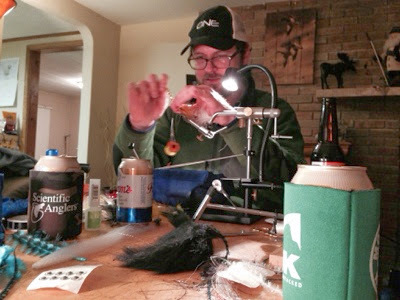 Erick Johnson and Dave Karczynski tying at Tom Hazelton's place a few weeks back. That's not entirely true. 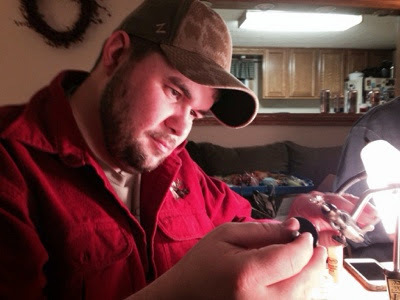 I went to a bunch of tying events, mostly at friends homes. 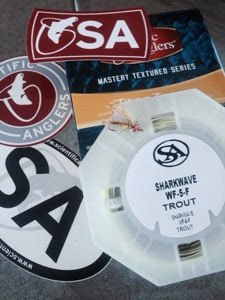 I've got two new fly lines to test from Scientific Anglers including the new Sharkwave line. I haven't finished my Mousing 101 series. I still have a review of the Sage Pike rod on tap. And I've finally gotten a couple of floats in with Alex Cerveniak, not that we had any success. I think I may need to set a writing schedule rather than just pounding something out when the mood seizes me. We'll see. The icy grip of winter is finally starting to ease a bit. There's little glimmers of hope here and there- long sunny days that set the snow and ice to melting on the roads, the occasional day in the forties and even a brief shot of rain here and there. The rivers are high and stained but the real run-off hasn't started yet. Meaning that the next couple of weeks will be the best early spring steelhead fishing. Then the run-off will occur. When the rivers start to drop and clear the main steelhead run will happen. In years like this with a heavy snow pack, it tends to happen fast. If you blink you'll miss it. If you fish any of the UP streams you can likely find fish the entire month of May. Well, that's all I know at the moment. Things are still kind of dull around here, but once spring hits it will get crazy fast. Have a great week. Let's get after it. There must be a starting point. "I thought of inviting someone else to come, but then I decided there is no one else I'd rather share the first float with than you." This is a rather heady compliment coming from Alex Cerveniak, proud and heretofore frustrated owner of a new used drift boat. 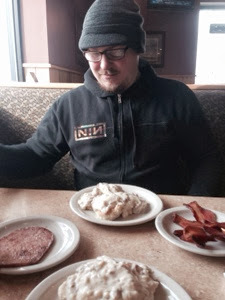 We're sitting in a diner, eating biscuits and gravy, ham and bacon, fueling up for an afternoon on the Holy Waters of the Au Sable. It will be our maiden voyage in this boat, a baptism of sorts, the kind of thing that holy water is for. 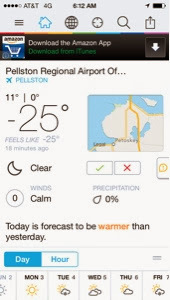 This is the warmest day we have seen in over fifty, and yet the temperature still hovers irritatingly below freezing. We linger over our plates, our breakfast presided over by the head of a dead elk hanging above the mantel, before heading out to Gate's Au Sable Lodge and Fly Shop, to do the obligatory Parting-With-the-Dough. Fly fishing has it's rituals, and you don't dare dispense with the spending money part. 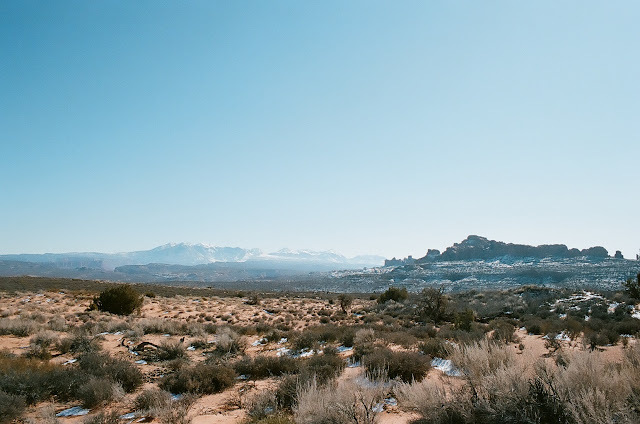 We drove out from there under a yellowing sky, the air still cold, but at this point nothing could dissuade us. Alex picked up his boat over a month ago and the bitter winter has stymied all efforts to get it on the water. He has spent evenings in his garage in his PJ's, drinking beer and imagining what it might be like to actually row the damn thing. There are times to concede defeat, and times like this when it is necessary to forge ahead. We got some intel (well worth the $22 spent on stuff I don't need) from the guide behind the counter and went from there. I would like to tell you this was a wildly successful fishing trip. It was. For one thing the country store where I first met Alex had a sale on Combos and so I had snacks for the entire day. That Buffalo blue cheese flavor is killer. For another, we were actually on the water, instead of sitting at home wishing we were. Oh, and we both saw a fish, though not the same one. Alex rowed and fiddled with his inadequate anchor. He's working on it. I did some casting and gave expert advice from the front stanchion ("slide into that spot right there past the downed cedar right next to the shelf ice"). He let me row for a little while, but he has a strong captain streak in him. This is a good thing in my opinion, as it guarantees I will get a lot of time up front. Alex put on his usual casting clinic. He lifted casts I would have been happy with and then would proceed to actually hit the log he was casting too. These casts should have triggered violent irritation strikes judging by they way they were irritating me, but it could be that brown trout do not share my jealousy of good casting. I spent half the float dissatisfied with the water, however Holy it may be. Holy? Sure. Infallible? Never. This is my cover for my lack of knowledge, technique and skill. The water was too shallow, lacked cover, was too wide open, in my considered opinion. But rivers have a way of discerning this and responding, and soon we were into beautiful bends with deep water and jaunty crossover riffles, the kind that hold rainbows and brook trout, with surly, heavy shouldered browns lurking in the bends like bouncers at a club. Stripped of my excuses, I kept casting and lost a lot of flies, all of which I had tied myself. This did not in any way remove the sting of their loss. Never mind that most of them looked like belly button lint. Yes I regularly find gold wire in my belly button. Alex thinks I should have fished the inside bends more. I don't. Where we fished the river is relatively small and most of the inside bends are less than a foot deep. This debate will continue for some time. There are so many things that can add up to a perfect trip. 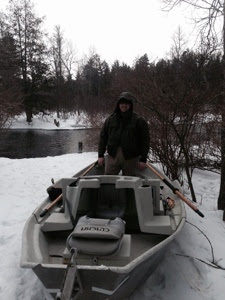 Before starting this blog I used to always fish alone. Fly fishing was my escape from human kind and their machinations, save their dastardly fly reels. This was a perfect trip. Two friends, an untried drift boat, two sketchy launches and a Hydroflask full of alcohol of indeterminate lineage. No fish were necessary. I tied double bowline knots, one on each end of a hundred foot nylon rope Alex brought to drag the boat up the un-plowed part of the launch. They both failed, drawing up tight to the hitch points. I didn't think this was possible with a bowline knot, so if any of you have some insight into this I appreciate it. Fontinalis Rising emerged from his ice cavern in the northern reaches of his peninsular home. He stood blinking in the bright sun, puzzled by this apparition in the sky. The sun was shining, and yet the air was brittle with cold, and when his nostrils froze shut he turned back into his lair. At that point he saw his own shadow and he knew- the long hibernation was not over. Six more weeks of apathetic sleep. 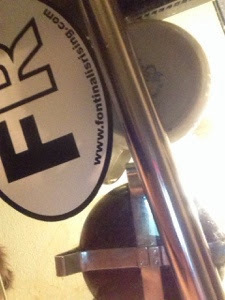 As Fontinalis Rising was returning to his wintry somnolence, something clicked in the reptilian core of his brain. It was telling him something, something vital to his very being. It was reminding him it was not enough to sleep and eat and breathe and rest in blissful slumber. A syllable kept echoing in his mind, emanating from this primordial neural knot. It kept chanting to his subconscious telling him he was a b. . .
Then it snapped into his consciousness, like a towel to the tush in a locker room- Fontinalis Rising is a Blarger, with a Blarg, an entity he had created which had achieved a life of its own. Wiping the crap from his eyes, a phrase, a title started bouncing around the vast empty spaces of his skull like popping corn. Mindy Mourning Carpy, something he used to blarg about regularly. He's not sure why. Something used to wake him in the mornings, snapping his mind sharply to attention so he could focus on such things, but he no longer remembers what that is. Fontinalis can only assume that Carpy is a hot drink made by burying a carp underground, then exhuming said fish when it is fully fermented, unctious, liquid and aromatic. It is then macerated, heated, coddled, massaged, strained, whipped and the froth skimmed (it makes a great garnish for Caprese salad) siphoned into a cauldron, heated, stirred counterclockwise seven times with a dash of nutmeg and Sriracha. Then it is ladled into tankards and quaffed to ward off the winter blues, its rich aroma festerifously permeating everything, a reminder that never truly washes off. Then Fontinalis remembered Mindy. How she liked, no loved, no craved Carpy. It was the one libation that got her through the Ice Times, summer malaise and PMS. Poor Mindy, and now in the depths of this harshest time when carp were nowhere to be found. The ground was buried under 4 feet of snow pack and frozen hard as granite. Even the carp she had buried like so many acorns would be locked in place until the spring thaw, sometime in June. And thus Mindy Mourning Carpy. So to those of you who carefully husbanded your Carpy I congratulate you. Savor it. Sip it slowly. Strain the bones through your teeth. Save up the residue as an emollient, salve and sunscreen. Sell it on the Black Market to Russian mobsters. After all, Carpy is the only essence of warmth left to us, the broth of the golden sun worshiping symbol of summer. Thank you for reading my blarg.